Too many writers over-prepare one big pitch, sure that it’s going to blow the town away. It’s fine to focus on one idea, practice it in front of the mirror, try it out on friends, etc… But remember, as soon as the producers give any indication that they aren’t interested, you have to drop it immediately and move on to another pitch. I was first warned about this problem by Simon Kinberg. He told a story about being called in by Universal, who wanted to hear horror pitches. He had two weeks to prepare, so he carefully crafted a sure-fire million dollar horror idea, complete with a 30 minute pitch detailing every beat of the story. Just in case that somehow didn’t sell, he also worked up five minute pitches for two other ideas. On the day of the meeting, Universal quickly dismissed the million-dollar idea, then waved away the two five minute pitches. 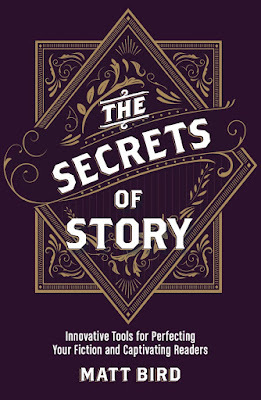 At this point, all he had left was a list of seven more titles with no stories attached, but he started listing them off and coyly implying that he couldn’t say too much about them. Finally he got down to the last one: all he could tell them was that it would be a movie about a western ghost town called Ghost Town. 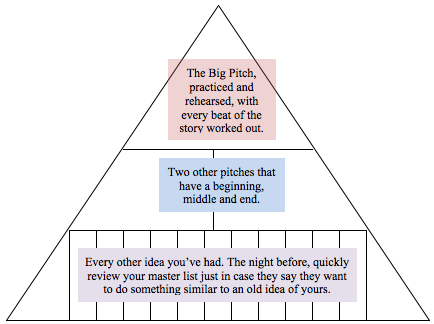 In your mind, have an imaginary pitch pyramid: Every time they look bored, slyly make your way down the pyramid. Guess what always piques their interest? Something from the bottom tier. You’ll be glad that you reviewed your master list of projects. And don’t be afraid to literally bring in a cheat sheet. There’s a myth that says that writers can’t ever consult notes in a pitch, but that’s not true at all. 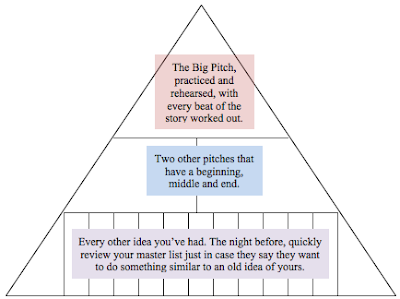 Don’t read your pitch, of course, but don’t force them to watch you racking your brain either. Next week: Don’t let them kill you with kindness. Matt: This is a fantastic blog series -- something I wish I'd had a few years back when I began my own "couch and water" tour. And I can second the fact that the tiny ideas at the bottom of the pyramid usually spark the most enthusiasm ... though, I'm not always sure "enthusiasm" is a good thing (as I suspect your next post will discuss)! Once again, Matt, thanks for content and analysis we can't get anywhere else. This entry validates something I've been doing for a few years, keeping one giant document file with a list of every idea I've ever had, along with working titles, loglines, images, scenes, bits of dialogue, whatever...It's a big sloppy mess for my eyes only and I add to it and update it all the time. But the one thing I never do is cut anything out of it... I have two other lists like this. 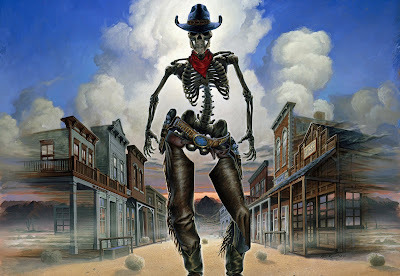 One for when an idea feels more storylike, has a strong, clear logline and a solid title and can be fleshed out to at least a paragraph or so. Another document is simply a huge list of cool sounding titles like GHOST TOWN. As for the bottom most ideas being strangely popular in the room? Maybe it's simply the sense of excitement any evocative idea has that isn't all that worked out yet. Not much detail means nothing to hate?